The Capotain is a conical felt hat with a brim. As worn by the Puritans it has a simple hat band and buckle. The same hat is worn by the American Pilgrims, and similar hats are shown worn by Leprechauns. Photo copyright 2010 Lesley Shepherd, Licensed to About.com Inc.
A range of felt hats for dolls house scales are easily made with these instructions for making a Capotain, or conical crowned hat. A large number of popular hats for historical or fantasy costumes are made with conical crowns. The capotain was a popular hat worn from the mid 1500's to 1600's and is seen as the Puritan and Pilgrim hat with a plain brim, as well as adapted for use as a military Shako or Fez , with a small peaked brim (the Shako) or no brim (the Fez or Tarboosh). The Puritan hat style also crossed over into the illustration of leprechauns and is commonly associated with them as well. The tutorial which follows shows you how to shape a circle of wool felt (it must be wool felt as it needs to shrink!) into a range of hats with conical crowns, with and without brims. Once you have learned the technique you can use it for everything from felted victorian riding caps, mens 'beaver' felt hats and hats for the 'mad hatter'. Small Amount of Wool Felt - for the 1:12 scale Puritan's hat shown above I used a circle of felt 2 1/8 inches in diameter. If you do not have wool felt, other woven or knitted wool fabric may shrink and felt. Try scraps left over from other proejcts. A Suitable Size Cork (not plastic) - The cork is tapered in shape and is used for shaping the crown of the hat. For a 1:12 scale doll I used a #4 cork which is 13/16 inches (20.6 mm) long, 5/8 inches (15.9 mm) diameter at top or wide end and 15/32 in. (11.9 mm) at the base of the taper. General hardware stores often sell corks. If you cannot find a suitable cork, you can make a hat form by sanding a piece of wood dowelling to similar dimensions. The cork must be made of real cork and not plastic or rubber as it must withstand the hottest temperature of your iron. Oven Mitt or Glove - To protect your hand when ironing and shrinking the felt. Small Buckle I used a metal buckle from Rio Rondo Enterprises, but you can make a suitable buckle from aluminium or tin foil or painted card. Make a printable Puritan's Hat - This pdf (acrobat reader file) for a Capotaine hat has printable parts to make paper or card hats in 1:6, 1:12, 1:24 or 1:48 scales. If you prefer you can use the templates to make hats from fabric. A circle of dampened felt is held evenly over a cork hat form for a dollhouse scale hat using pins before the felt is shrunk. Photo copyright 2010 Lesley Shepherd, Licensed to About.com Inc.
To form a tapered or conical crown for a range of dollhouse hats, you will shrink a piece of dampened felt with an iron, over a tapered hat form. The easiest form to use is a small cork in the appropriate size for your doll. The length of the form isn't important as long as the form is long enough for the height of the crown you need. I needed a one inch length of the cork to shape my Puritan's hat in 1:12 scale. A wine cork might work for playscale dolls in 1:6 scale. Cut Out A Circle of Felt - To begin, cut out a circle of felt, large enough to make the hat you want. If you are uncertain, cut the felt circle larger than you expect to need, you can always trim it back. For the 1:12 scale Puritan or Pilgrim's hat with a brim, I used a circle of felt roughly 2 1/8 inches in diameter. If I was making a Fez or Shako, I could use a smaller circle. You will need a piece which will cover 2x the height of your hat, plus 2 x the width of the brim, plus the distance across the top of the hat. Wet the Felt - To get your felt to shrink to shape you will need to wet it thoroughly and iron it with a hot iron. Attach The Felt to the Hat Form - Center the felt circle over your hat form (cork) using the narrow end of the cork as the top of the hat if you are making a 'traditional' Puritan or Pilgrim's hat or Leprechaun's hat. Some Shakos and some Leprechaun's hats are wider at the top than where they join the brim or peak. If you want to make this shape of crown, center your felt over the thickest end of your cork or hat form. With the circle of felt centered over the end of the cork, stretch the felt down the sides of the cork and anchor it with a dressmakers pin. It should be anchored to the hat form (cork) at the point where you want the brim and the crown to meet. I set mine at the very base of my one inch cork to give me roughly and eight inch scale crown when the hat was finished. Stretch the felt over the opposite side from the position of your first pin, and anchor the felt on that side. Now anchor the felt midway between the two pins on each side. The object here is to spread the circle evenly around the cork, so that as you shrink the felt, the hat will have even fullness around the base of the crown. Start To Shrink The Felt - Using a hot iron (and wearing an oven mitt to protect your free hand!) begin to press the felt to the cork down the sides of the cork towards the pins. Do not move your iron back and forth, just press it firmly into the cork. As the felt begins to shrink you will notice it beginning to form peaks and valleys of extra felt at the base of the cork. When these peaks and valleys are evenly found around the cork, stop pressing and proceed to the next step. As the circle of felt for a dolls house scale puritan's hat shrinks to fit the cork hat form more pins and thread are used to hold the brim line. Photo copyright 2010 Lesley Shepherd, Licensed to About.com Inc. When your first round of pressing your damp felt to your cork hat form is finished, you should have the beginnings of a crown shape, with lots of pleats and folds of extra felt at the base of the crown where your felt is pinned to the form. To eliminate these pleats, set a pin between each of the four pins you have already placed on the form, then set another pin between each of eight pins, carefully pinning the 'bumps' of felt to the cork at the same point as the original pins. You do not want any bits of felt to overlap, you want the use the pins to keep the felt evenly spread around the cork at the point where the brim will be on your hat. (see photo above). With the pins in place, dampen your felt crown again. Hold the crown on the edge of your ironing board with the pins out of the way over the edge, and carefully press the dampened felt using the point of your iron, move the iron when you don't see any more steam, and keep rolling the hat form as you press so that you press evenly all around the form. By the time you have gone around the form completely two or three times, you should notice that your felt has shrunk against the cork, and is now almost smooth near the pins, without the earlier folds and valleys. Keep pressing (redampening the felt crown if necessary) until you have shrunk the felt so that almost all the 'gathers' of extra felt are gone near the pins. A dolls house scale fez or shako is shaped using pins to hold a felt circle over a cork form. Photo copyright 2010 Lesley Shepherd, Licensed to About.com Inc.
To make the process of shrinking the felt easier to see, here is a photo of a Fez being formed without a brim. The bumps at the edges of the felt circle are all held tightly to the cork hat form, and the felt has shrunk nicely so that it is almost completely evenly shrunk around the cork form. You may need to dampen and press your felt carefully against your form several times before it shrinks this neatly. You can keep your iron against the felt until you can't see any more steam (I use a dry iron on wet felt so I can watch this) Hold the hat form in place on the edge of your ironing board with a wooden kitchen tool, or carefully hold it in place while you iron with your hand covered with a heavy duty oven mitt for safety!. A tapered crown is held to the cork hat form with thread for the final pressing and shrinking of the felt for a dolls house scale fez or shako. Photo copyright 2010 Lesley Shepherd, Licensed to About.com Inc.
A conical crown is held in place with thread while the brim of a dolls house scale felt Puritan's or Pilgrim's hat is pressed flat with an iron. Photo copyright 2010 Lesley Shepherd, Licensed to About.com Inc. 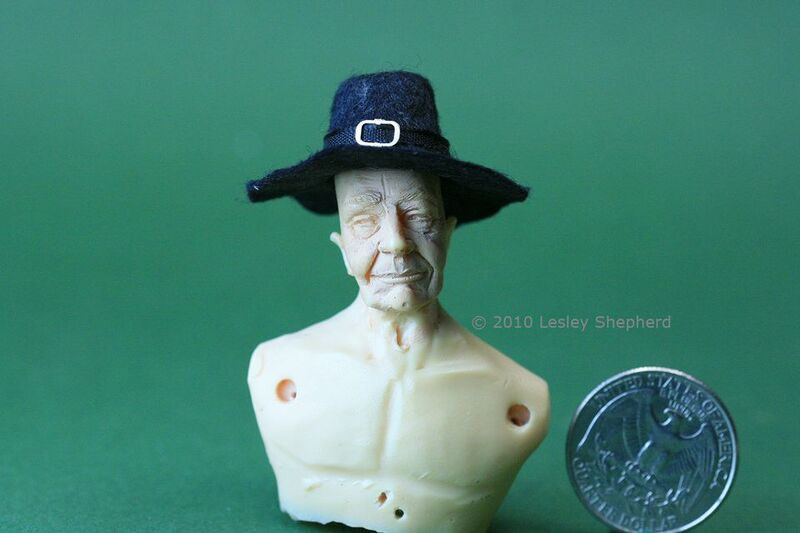 In the photo here you can see how the thread and last few pins anchor the crown and brim of the miniature Puritan's hat to the cork hat form. At this point the crown of the hat should be finished and you will now need to work on evening out the fullness of the felt where the brim joins the crown. Dampen the brim area of the hat below your thread and anchoring pins. Set the hat on the edge of your ironing board so that you can iron the brim flat, without the cork form getting in the way. Use the point of your hot iron to press from the outer edge of the brim towards the crown of the hat, flattening out any bumps and folds carefully. Work evenly around the hat, dampening the brim and beginning again when you have gone completely around. Keep pressing and shrinking the felt on the brim until the bumps where the brim joins the crown are all smoothed out and the brim is flat. Don't worry if it is an odd shape, it will be trimmed during the finishing. Set the hat, still on the form, aside to dry and cool. Pva glue is spread in a thin application inside the tapered crown of a dolls house scale fez to set and hold the crown shape. Photo copyright 2010 Lesley Shepherd, Licensed to About.com Inc. When you are sure your dolls house felt hat is completely dry, arefully remove the pins that held the felt crown against the hat form and take the hat gently off the form. You can leave the thread in place until the glue has dried. Brush a thin layer of pva glue inside the crown of the puritan's hat (shown here with a fez instead so you can clearly see the crown area). Do not use too much glue or it will seep through the felt. You need a layer that will be visible inside the hat once it is dry, but not visible on the outside of the hat. You can always add more glue in a second coat if you don't put enough on to hold the hat shape the first time. It is very hard to remove too much glue, so if you are worried, do two thin coats. Set the hat aside to dry. The coating of glue inside the crown will hold the felt stable and prevent the hat from changing shape. When the glue has thoroughly dried, removed the thread and proceed to finishing your hat. For a Fez or Tarboosh - This style of hat is found in many places throughout the middle East, Greece and Turkey. The Fez is often a deep red color, but they can be made in other colors as well. To finish a Fez, trim the base of the crown so that it is even at the base. Make a small tassel from embroidery thread and attach it to the center of the crown of the hat. For a Shako - Make a small peaked brim from plastic, leather, or coated or painted card, and glue it to the front bottom edge of the hat crown. Add feathers, chains and metallic trims suitable to the regiment (or band)you are are representing. For a Puritan , Pilgrim's or Leprechaun's Hat - These hats usually have a plain black hatband and a silver buckle. Thread a thin piece of black ribbon or thin leather strip through your chosen buckle and glue the ends of the strip over one another at the back of the hat. Trim the brim to your chosen width, pressing it flat, or turning it up gently on the sides. Although Leprechauns these days seem to wear green hats, they have also been 'seen' in black and brown versions. Other Hat Styles - The capotain with shorter crowns is often seen as a woman's riding hat, and with a larger looser brim, it was seen on farm laborers in Europe and hillbillies in America. This is a very useful style of hat to learn to make, as you can adapt it for many purposes.